A penny that saved a soldier's life when it deflected an enemy bullet during World War One has been sold at auction. 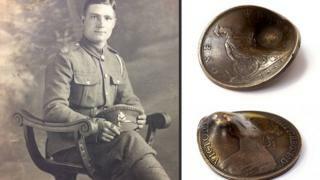 Private John Trickett carried the coin in his pocket, which saved him from being shot in the heart. The dented penny, dating from 1889, was part of a collection of military memorabilia that sold for £4,500. It was bought by Pte Trickett's grandson, having been put up for sale by another relative. Derbyshire-based Hansons Auctioneers had originally estimated the lot to be worth £30 to £50. Aged 19 at the time, Pte Trickett's brothers Billy and Horace both died in the conflict, and after the shot ricocheted off the coin he was left deaf in his left ear. Other items sold alongside the coin were Pte Trickett's British War Medal and Victory Medal. The items were bought by Pte Trickett's grandson Nigel Trickett. The 55-year-old, from Owston Ferry in North Lincolnshire, said he would "take a lot of pride" in showing off the collection. "When the story went viral it brought 50 members of the family together," he said. "Everything wouldn't have happened in our family the way it has without that penny." Pte Trickett's grand-daughter Maureen Coulson, who sold the lot, said the story had brought her back in touch with her family, adding she plans to give some of the proceeds from her cousin to charity. "I've experienced a mixture of emotions from beginning to end," she said.